We have renovated our Hotel-Chalet Dlaces, furnished it with care and love in order to make your holidays more pleasant. 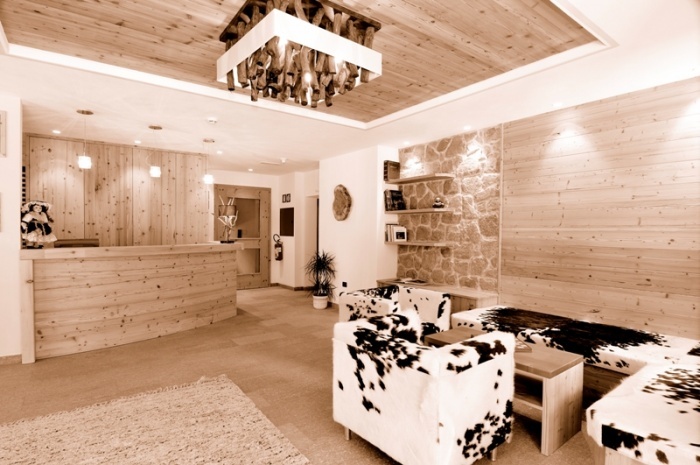 The new rooms and apartments are bright and comfortable; the equipment is made of wood and modern, but maintains the style, the comfort and the snugness of our South-Tyrolean tradition. Enjoy the comfortable facilities of our new suites, rooms and apartments: big balconies, partially green terraces, bathroom or shower/WC, hair-dryer, make-up mirror, satellite, safe and internet connection. In the breakfast room you can have a delicious breakfast in a warm and pleasant atmosphere for starting your day well: you can choose among a wide offer of tasty fresh local products at the breakfast buffet. 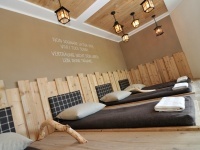 After hiking you can relax your body and soul in our new wellness-centre LUJANTA: Finnish sauna, Turkish steam bath, relaxation area with hay and stone pine beds �.. especially in the dreamlike outdoor hydromassage whirlpool in the garden: that is pleasure and enjoyment in its best way! As our house is situated in a quiet and sunny location, our guests can admire the wonderful view on the village and on the surroundings; it�s about one km distance from the town-centre. The location of our Chalet Dlaces, in the middle of green fields full of flowers, is particularly handy in the summer, as it is the starting point of walks to the mountains or to the surrounding woods. Please note that the United Nations Educational Scientific and Cultural Organisation's World Heritage Committee unanimously declared the stunning Dolomite mountains a United Nations World Heritage Site. Close to our Chalet there is also the possibility to have lunch and/or dinner in a recently built, very nice restaurant and pizzeria called �L Muliné� (www.l-muline.com). Junior Suite with panoramic view to the mountain "Fermeda"
Our Hotel Chalet Dlaces ***S is easy reachable by car. In the centre of Selva, take the 1st right a drive about 1,5 Km straight ahead and you will see our wonderful house in peaceful location.